The winter months bring more than just cold weather and shorter days; they bring the possibility for winter storms that may result in a snow- and ice-covered landscape. While it may be a winter wonderland for some, as a property manager, snow and ice buildup means a hazard with the potential for costly liability. If you deal with either commercial or residential property, you are responsible for the side effects of winter. 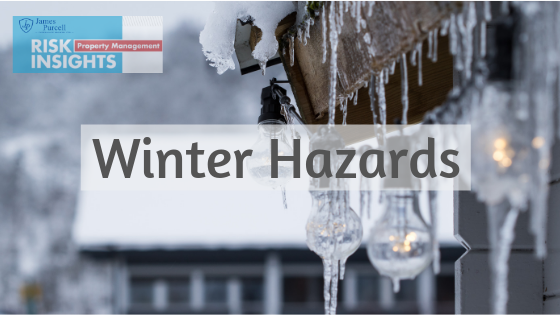 In legal terms, snow and ice are the same as any other hazard presented on a property, and just like any other hazard, property managers can be held liable if they cause injury. To avoid litigation resulting from winter injuries, it is important that you are vigilant in your snow and ice removal efforts. Winter brings a variety of hazards that you need to prepare for; however, slips and falls are by far the most common injury associated with winter weather conditions. Diligent snow and ice removal can go far in keeping walkways and parking lots safe. Remove snow quickly after snowfalls, and salt regularly to keep ice from building up. In legal terms, snow and ice are the same as any other hazard presented on a property. And just like any other hazard, property managers can be held liable if they cause injury. Not all winter hazards are under foot, however. Icicles, along with other accumulations of frozen or heavy snow above walkways and building entrances, can cause serious injury if they fall on those below. Remove icicles and other buildup as soon as possible. If it still appears to present a hazard, consider rerouting foot traffic around the area. Performing preventative maintenance in the summer and fall can also keep you prepared for winter storms. Make sure eaves are properly installed, and check that downspouts are aimed away from walkways. If eaves leak or downspouts direct water onto walkways, snow that melts in the heat of the day has the potential to freeze and create a hazard with cooler night-time temperatures. For smaller residential rentals, such as single family homes or duplexes, the responsibility for snow and ice removal is commonly accepted by the tenant. To make sure responsibility is clearly established in this situation, the lease should include a provision citing the tenants as responsible for any snow and/or ice removal. This section of the lease should also establish how long after a snowfall the tenant has to clear public areas such as sidewalks, as most areas may have laws requiring prompt snow removal. It is important to be as specific as possible to avoid any unnecessary liability or disputes after heavy storms. © 2011-2013 Zywave, Inc. All rights reserved.